If you don’t own a hammock, are you even a Regent student? In all seriousness, Regent has one of the most hammock-friendly campuses, so if you don’t own one you’re really missing out. There are several prime spots to set up your hammock; some are better for schoolwork while others simply boast relaxing views. Make sure to consider your options in order to make an informed decision of where to set up your temporary canvas of chill. At first glance, this spot seems to be the prime place to set up. You’re closest to the pond, can enjoy the relaxing sounds of the fountain, and you have an open view for watching the sunset. But once you begin to set up, your hammock will be hanging quite low. The two trees here are not very far apart and do not have a lot of trunk to work with. If you’re able to adjust your hammock to the proper height (after several attempts falling short), you will then notice that there is a lot of foot traffic coming right by your relaxing spot. Yes, this spot is right next to the path that most every student takes on their way to class. If you’re looking for complete peace and quiet, this spot may not be for you. It also seems to be uncomfortably close to the geese who hang around the pond, so maybe not the best idea for long-term kick-back time. This is a hot spot among students as several hammocks can be grouped together. You have nice views of the fountain in the pond while maintaining a safe distance from the geese. There are several trees to hang your hammock up high or down low. 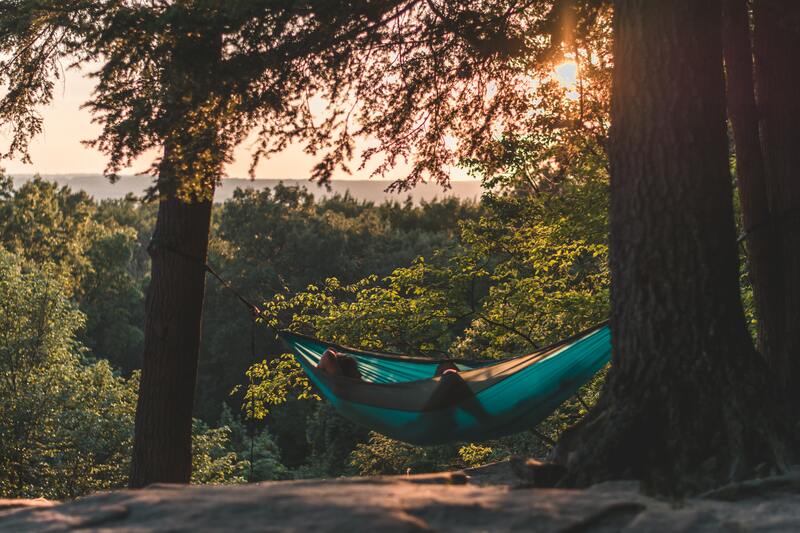 If you’re into social-hammocking, then this is the best place for you! The large amount of trees allows for multiple hammocks, the more daring students even bunking their hammocks over their friends! The only down-side might be the lingering smell of the coals if a fire was going the night before. It also has more of an obstructed view of the sunset – but hey, you set up to study right? Another wonderful spot is under any crepe myrtles on the campus green. Here, you can enjoy the aesthetic pink flowers in the spring, with good views of the Communications Building and the Chapel. It also is at the center of everything, making it a good place to set-up in between classes without having to go back over the bridge to the Commons. The people watching is prime, as well as the view of the sunset over Robertson Field. The large amount of shade makes it a great hang out spot for groups of friends – whether everyone has a hammock or not. The only problem? Allergies. This is a year-round issue, especially in late spring when a flurry of flower petals falls off the trees with each little breeze. Hopefully you’re not scared of bees! Now you can be an informed property hunter when looking for the best places to set up your hammock. Go on out and find your place to relax. Hannah Vermont is a contributor to the Daily Runner.